Ship Shape Elementary: Back to School Sale! 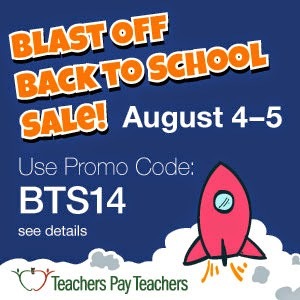 It is almost time for the TpT Back to School Sale! Beginning at 12:00 tonight MY ENTIRE STORE will be 20% off! Before the sale make sure you provide feedback on prior purchases so you can earn as many TpT credits as possible and get all of the back to school resources that your pretty little teaching heart desires! My wishlist is full and ready and I am pretty darn excited about this!